As many as 9 out of 10 black parents and 57 percent of Latino parents nationwide believe that schools in their communities are underfunded compared to those in white communities. 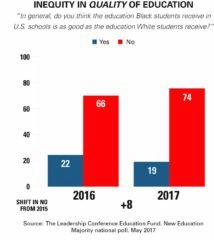 They also believe that racism is the second biggest obstacle for their children to receive a high-quality education, according to the second annual New Education Majority Poll. Black and Latino parents also believe that academic rigor and high expectations should be a priority for their children’s education. Nearly 90 percent of black parents and 81 percent of Latinos think their children can be held to higher expectations. “They think students should be challenged more in school so they can be successful later in life,” said Matt Hogan, partner at Anzalone Liszt Grove Research, which conducted the poll. 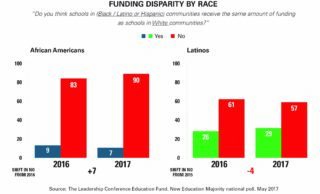 The poll was commissioned by the Leadership Conference on Civil and Human Rights’ Education Fund, the nonprofit arm of a group of civil rights organizations including the National Council of La Raza, the National Association for the Advancement of Colored People, and national teachers unions. 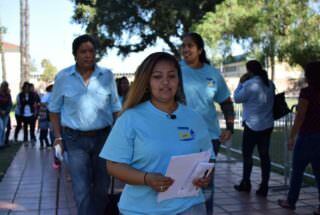 This year’s poll showed that Latinos reflected a more positive perception of their children’s schools, with almost three-quarters of Latinos (74 percent) saying that U.S. public schools are doing a good job preparing Latino students for success, a 10 percentage-point increase over last year. That perception was even stronger among Spanish-dominant Latinos. Sixty-six percent of black parents have the same perception, an increase of 8 percentage points. Hogan said 1,200 parents nationwide participated in the poll and that among them there was “very little awareness” of the Every Student Succeeds Act (ESSA), the new federal law that governs K-12 public education policy and replaced the No Child Left Behind Act. “These findings should inform education policy, particularly as states continue to implement ESSA — a civil rights law enacted to ensure that all children get a high-quality education. It is our hope that the New Education Majority poll changes assumptions about what black and Latino parents and families value and leads policymakers to put these parents, and their priorities, at the center of decisions about education policy,” said Wade Henderson, president and CEO of the Leadership Conference on Civil and Human Rights during a press telebriefing Tuesday for the release of the poll. “While these findings are not a surprise to anyone, these results should be a clarion call for policymakers who must come to terms with the fact that for any education policy to be successful, it must be responsive to the needs of the children who make up a majority of public school students in America,” he said. As of 2014, Latino and black students accounted for 41 percent of all public elementary and secondary students in the nation, according to data by the National Center for Education Statistics (NCES). The recommendations suggested that black and Latino families should be allowed to meaningfully participate in decisions on priorities and funding; that school systems prepare, hire, support, and retain strong Black and Latino teachers, and that black and Latino parents are engaged and consulted in the development and implementation of state, district, and school plans.